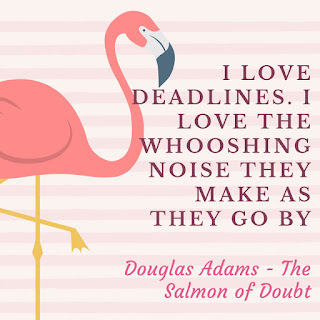 Like Douglas Adams, I also love deadlines. Deadlines keep me accountable, and keep me from prioritising binge-watching the entire new series of The Chilling Adventures of Sabrina instead of working on my book. Because that's the thing about writing-- sometimes, it's the only thing you want to be doing, and other times, you will literally think of any excuse to get out of it. Up until now, a lot of the deadlines that I have been working with have been self-imposed. Things like doing Nanowrimo, or entering competitions have provided the external deadlines, but no one has been waiting for me to enter those things. I chose to. Now, I have a manuscript to deliver to a publisher, and while that's a big exciting step, it's also a lot of pressure. I want to make sure that the book I hand over in a few weeks time is the best book it could possibly be, and that means making some hard decisions. 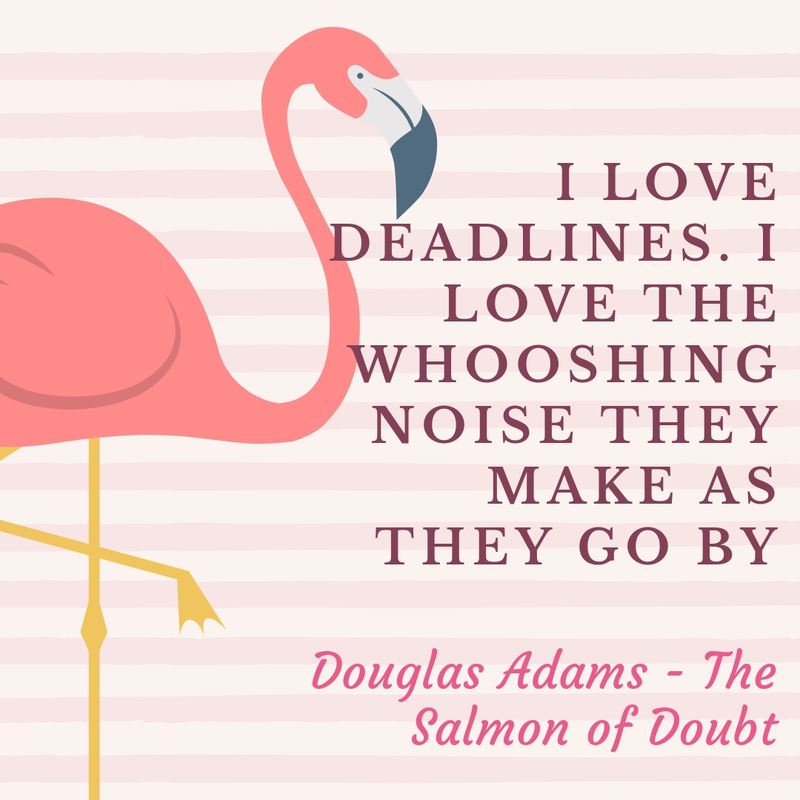 In this post, I thought I would outline for you a few of the things I do to keep myself on track, and give myself the best possible chance of meeting my deadlines-- although the irony of my writing this post when I could be working on the book is not lost on me! I keep seeing other writers going on Social Media hiatuses in order to focus on their writing, and this is one way to combat this issue. Personally, I find that it doesn't work for me. I'm like a dog without a bone. I keep looking for that little hit of endorphins I get from scrolling through posts, only to find it gone, and then I feel a little lost. Obviously I'm not the type who can go cold turkey, so instead I am focussing on winding back my phone dependence. I'm limiting how long I am allowed on social media each day, using one of the settings in the most recent iPhone update (Screen Time), and when I get comfortable with that amount, I wind it back a bit more. I'm hoping I can have my daily screen time down to a very small number of minutes by later in the year. By the same token, as writers, more and more of the marketing of our upcoming books needs to be done by us, and that means that we need to cultivate social media presences on more than one platform if we can. Therefore, I can't cut SM out of my life entirely, but I need to be more strategic about the ways that I use it. Bit of a conundrum, really! A few times this year I have had the alarming thought that my need to write was waning. There's this idea that if you can be happy doing anything else other than writing or making art, then you should do that, and this year I have been extremely happy studying to become a librarian, but I also still love writing-- why can't I do both? The challenge is to make sure that I am finding time for both passions, and with writing, as with many creative pursuits, the more you practice it, the more you create a sense of flow. Going to my monthly Write Nights sessions at the Centre for Stories has definitely helped me to feel connected to writing, as has talking to other writers, and making time for me to sit down with my book and just work. When there are lots of things to get done, it's normal to feel completely overwhelmed, as I was feeling earlier this afternoon. Writing a list of everything that I need to get done, and breaking the bigger tasks into their component parts, is something I find particularly helpful. I can see at a glance what I need to do, I can prioritise what needs to be done first and what things can wait until after deadlines have been met, and I know that I am not going to forget something important. When I was doing my honours year, I had an entire notebook devoted to these to do lists because an electronic one just doesn't have the same effect when it comes to focussing me on the task and sticking all of my obligations into my brain. I might start this notebook up again now! When I am particularly busy, I lose all sense of how close things are together until... disaster! I find myself with a week where everything is on at once and I let myself get run down. Using a desk calendar has really helped me in this regard. I keep it by my keyboard so I can see at a glance when assignments are due, when appointments are, and most importantly, when I have free time! There is nothing that you can do to totally relieve the pressure that comes with a deadline. You wouldn't want to. That pressure makes your work that little bit better a lot of the time, and focusses you on your work in a way that you just don't get to do when you feel like you have all the time in the world. I have been neglecting exercise in my routine of late, and this is bad because I just feel tired and sluggish and I just can't sit at my desk and work for as long. For other writers, it's sleep that falls through the cracks, or eating properly. I'm not saying break out the face masks and nail polish every single night, but I think it's important to do things that help you take care of yourself as a matter of habit, whether that's going to Yoga, or reading a book before bed at night, or making sure that you're visiting your Mum enough. With all this in mind, it's back to the editing for me-- let me know in the comments if there is anything else you do to help you feel organised and in control when you're working on a big project or you have a deadline, and I'll hopefully be back with another post sooner rather than later... though that all depends on how deep into the work I get!